The Chicagoland Observatory for Underground Particle Physics, COUPP, uses stable, room-temperature bubble chambers to search for weakly interacting massive particles, WIMPS, which physicists consider the best candidates for the material that makes up dark matter. Bubble chambers are containers of liquid, typically hydrogen, kept just above its normal boiling point but under just enough pressure that it will not boil unless disturbed. The first COUPP detector was a thin-walled quartz bell jar containing a liter of iodotrifluoromethane, a fire-extinguishing liquid also called CF3I. 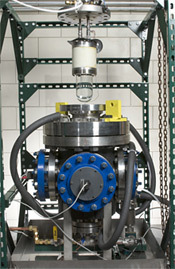 The second generation of COUPP detector will hold 30 liters of liquid. Researchers will place it in a deep-underground lab to block interference from cosmic rays. When a particle enters the jar and hits the nucleus of an atom in an iodotrifluoromethane molecule, it triggers the evaporation of a small amount of the liquid, causing the formation of a bubble. The bubble grows and eventually becomes large enough for researchers to see it, at which point they photograph the chamber with digital cameras. In normal operating conditions, most particles would leave a track of several bubbles as they interacted with the liquid. COUPP bubble chambers operate at a temperature and pressure in which most known particles fail to produce bubbles. The WIMP leaves a single bubble because its interaction, a nuclear recoil, happens within just a few tens of nanometers.